Karla Osorio Projects presents its participation at Design Miami 2018, the global forum for design, bringing together the most influential collectors, gallerists, designers, curators and critics of all around the world in celebration of design culture and commerce. 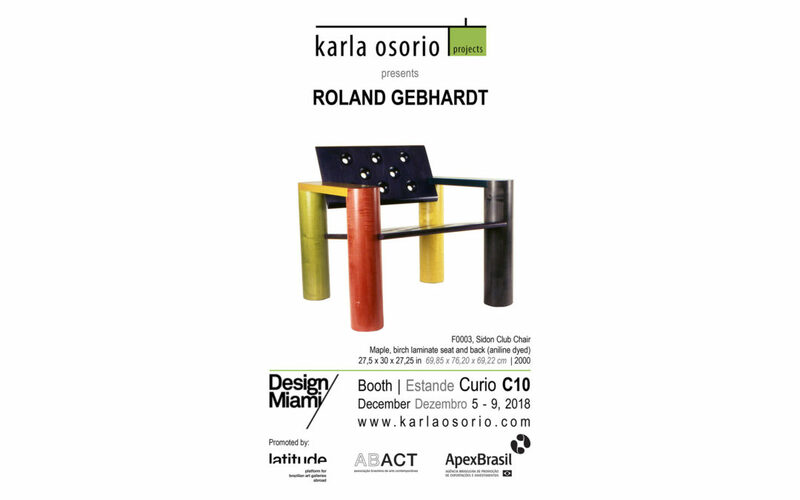 The art gallery originally from Brasília also debuts its parallel initiative called Projects, and exhibits the works of the historical minimalist artist, Roland Gebhardt. With a career mainly devoted to design, he participated in large-scale and urban projects in the United States, Europe, and Japan, and created a line of sculptural furniture in the 1990s and 2000s. Meanwhile, he never abandoned his artistic practice, producing works that have not been shown for almost thirty years. His study of the void has inspired him since the very beginning – the methodical, obsessive repetition of objects and themes and a predilection for volumes and their enigmatic nature are markers of his work. The artist “interferes,” using cuts and incisions to rigid or organic materials, such as boulders, wood, steel, paper, aluminum, fruits, vegetables, and books. Gebhardt rewrites the history of the material, denatures it, creating new geometric lines. The vocabulary and materials used in his furniture are familiar, fostering a sense of reassurance and comfort, yet the sculptural forms of the furniture are unique and innovative. The dimensional design is minimal, simple, and unadorned. The design principles, joinery, and assembly are respectful of the materials used. Each piece is faithful to his design principal and connected to his artistic path. Born in Paramaribo, Suriname (1939), educated in the Netherlands, Switzerland and Germany, he lives and works in New York. Master of Fine Arts. Art Academy of Hamburg, 1964. Gebhardt is a sculptor whose minimalist work has been shown around the world and is already included in several prominent collections. Best known for its monolithic sculptures at the 70s exploring the concept of linear void, some run as large-scale environmental sculptures (Wave Hill and Storm King in New York). He was released with the group of minimalist artists as Donald Judd, Carl Andre, Richard Serra, Brice Marden and many others, at shows in 70-80 years including ‘The Minimal Tradition’, at Aldricht Museum. In 2008, he launched the multi-media piece “The One Tribe” in Art & Technology Center 3LD in New York and did sculptural masks in “Dancing Sculpture” series. Since 2013 he conducted experiments on Storm King Art Center and at Institute Chautauqua unveiling spatial relationships built at the intersection of identity, abstract sculpture and landscape. In 2014, he presented “Trophies” unique collaboration between sculpture, dance and music that explores issues of identity and transformation of the living (Erie Art Museum in Erie, Pennsylvania). Very active in community activities related to the preservation of city planning and architecture in New York. For many years devoted more to the design, participated in projects in the United States, Europe and Japan, creating line of sculptural furniture. He never abandoned his authorial production but did not exhibit it for almost four decades. In recent years he developed a series of three-dimensional drawings on paper and striking sculptures in corten steel, aluminum and zinc, keeping the tradition of minimalism and conceptual sculpture. Most recently he exhibited his work in a solo show in Brasilia, Brazil and in art fairs such as SP-ART, VOLTA Basel e NY, EXPO Chicago, India Art Fair, among others.